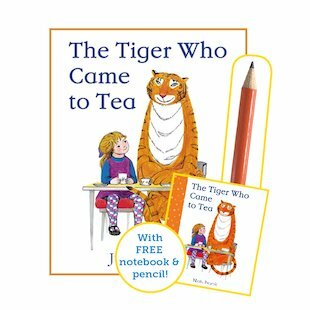 What’s even more exciting than having a tiger round to tea? That same tiger bringing lovely gifts! That’s right: to celebrate the 50th anniversary of this classic story, the tiger has a FREE notebook and pencil for you! Ding-dong! The doorbell rings just as Sophie and her mummy are sitting down to tea. Who’s there? A big, friendly orange tiger. He’ll have to stay for tea, of course! Well – a tiger this size has quite a big tummy. Just be warned: he’s rather hungry! But however much he gobbles up, sharing is caring, and we love being around this furry friend!